Maureen Kelly founded a great company in tarte and I firmly believe the Amazonian Clay blushes are among the longest lasting blushes I have ever worn. I often wear "Amused" as it adds a great pop of color to the apples of my cheeks. 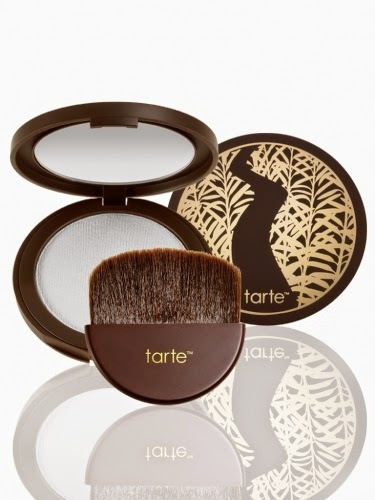 Tarte's Summer 2014 brings a lot of new products and one that I truly needed was Smooth Operator Amazonian Clay Pressed Finishing Powder ( $34). As soon as it gets warmer, I tend to get a bit oily in my T-Zone area and this pressed powder does the trick of keeping my face shine free. This compact and brush applicator deliver tarte's best selling Smooth Operator Amazonian Clay Finishing Powder in a pressed format. It's lightweight and feels so smooth to the touch. It helps to mattify your skin, minimize the appearance of pores and also reduces excess oil leaving a soft focus finish. Available now at Sephora, Sephora.com , Ulta, Ulta.com , Macy's and Tarte.com . Hooray for warmer weather!